"The most intriguing new American musical to reach New York in several seasons: bright, original and moving" is how Variety described YANK! 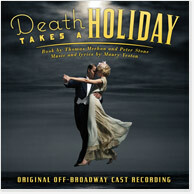 following its 2010 off-Broadway premiere. Its twice-extended, sold-out run at the York Theatre was the recipient of 7 Drama Desk, 3 Outer Critics' Circle, and 2 Lucille Lortel nominations - all including Best Musical. Written by Joseph Zellnik (music) and David Zellnik (book and lyrics), YANK!, a love song to Hollywood's "it takes one of every kind" platoon flicks, tells the story of Stu, a scared Midwestern kid who becomes a reporter for (the real) Army magazine Yank, faces his fear in battle, and perhaps even scarier for him, finds love with a fellow soldier named Mitch. With a lively and tuneful score inspired by the theatre and pop sounds of the 1940's, the show captures the spirit and exuberance of the World War II era even as it explores questions of prejudice, courage and survival. Following its initial run, the Zellnik brothers continued to refine the show, adding three new numbers and engaging legendary Broadway orchestrator Jonathan Tunick to provide all-new charts. 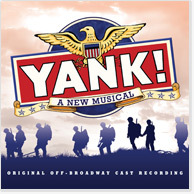 Now, cast members Bobby Steggert (Tony nominee, Ragtime; Big Fish), Ivan Hernandez (Into the Woods), Nancy Anderson (Far From Heaven) and Jeffry Denman (White Christmas) reunite under the baton of music director Rob Berman to record the Original Off-Broadway Cast Album of YANK!